ALL-PRO's LED Dusk to Dawn Outdoor Security area wall Light combines high performance optics with super bright energy-efficient LEDs. Its rugged user friendly construction has a dusk to dawn photo control for nighttime ON and daytime OFF settings that provides a reliable security solution. This fixture provides larger area coverage than standard 60W incandescent lamp while achieving substantial energy and maintenance savings. Perfect for illuminating small areas like porch, patio, pathways. Durable LED Flood Light made for Canadian climate. The high quality Cree LEDs have an extremely long 50,000 hours average life.This floodlight emits 1218 delivered lumens, and its colour temperature is Medium white - 3,000K.They consume only about 13% as much power as comparable halogen floodlights.Ideal for lighting parking lots, walkways, and for other safety and security purposes.Three year warranty. Durable LED Flood Light made for Canadian climate. Features quality motion sensor for reduced energy consumption. The high quality Cree LEDs have an extremely long 50,000 hours average life. This LED floodlight emits 1218 lumens, and its colour temperature is Medium white - 3,000K.They consume only about 13% as much power as comparable halogen floodlights.Ideal for lighting parking lots, walkways, and for other safety and security purposes.Three year warranty. Twin bullet style 200 Watt (2x100w Halogen Bulbs included) security floodlight with 180 motion activated sensor. Precision Plus Doppler Radar motion sensor combines Doppler Radar with traditional PIR (dual technology) which protects your home with improved reliability, area coverage and stable performance. Motion sensor turns lights ON automatically when motion is detected and OFF after a pre-selected time delay (1 to 12 minutes). Integral photo cell design prevents lights from turning ON with motion during daylight hours (auto modes). Universal Die Cast cover plate mounts to standard recessed or surface mounted junction boxes. 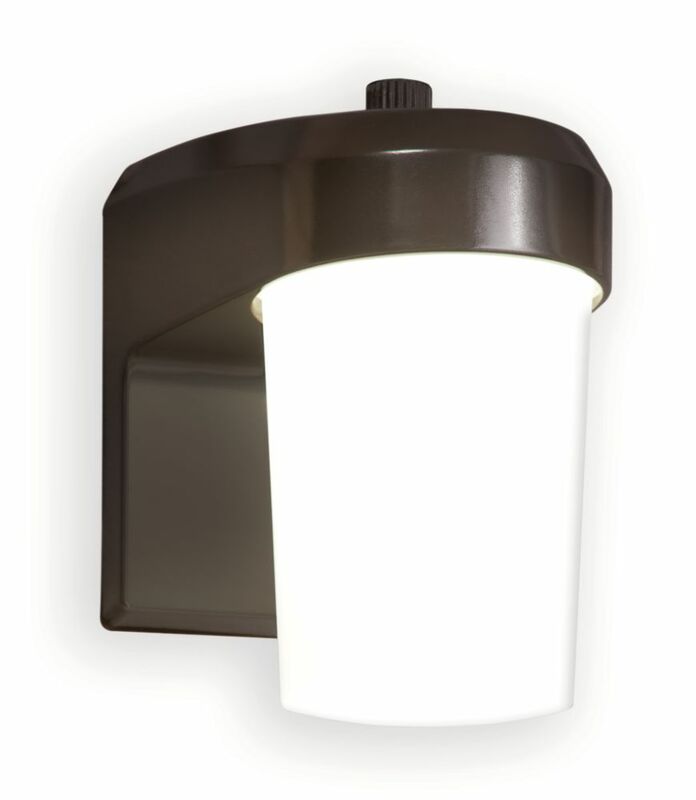 LED Area Wall W Photo Cell, Bronze ALL-PRO's LED Dusk to Dawn Outdoor Security area wall Light combines high performance optics with super bright energy-efficient LEDs. Its rugged user friendly construction has a dusk to dawn photo control for nighttime ON and daytime OFF settings that provides a reliable security solution. This fixture provides larger area coverage than standard 60W incandescent lamp while achieving substantial energy and maintenance savings. Perfect for illuminating small areas like porch, patio, pathways. LED Area Wall W Photo Cell, Bronze is rated 4.3 out of 5 by 30. Rated 5 out of 5 by HomeDepotCustomer from Great light output for small amount of power being used.... Great light output for small amount of power being used. I will purchase another soon. Rated 5 out of 5 by Brandon from Great Product! ... Great Product! Rated 5 out of 5 by Crashaw from Great light, easy to install, very bright and the dusk to dawn feature works as designed. Great light, easy to install, very bright and the dusk to dawn feature works as designed. Rated 4 out of 5 by Grandote from Easy assembly and performs great! No need for timer... Easy assembly and performs great! No need for timer as the photocell does the job.